Located in Maharashtra, India, we are actively engaged in manufacturing, supplying and exporting of ASTM A333 Carbon Steel Pipes. We offer A333 Grade 1, 3, 4, 6, 7, 8, 9, 10 & 11 in our Carbon Steel Pipes. 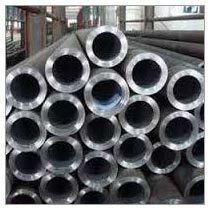 Made from high-grade carbon steel, our pipes are in conformation with the industry laid standards. We make available Carbon Steel Pipes in bulk quantities and at very nominal rates. Size Ranges : 1/2" - 48"